Palestinian amora; lived in the third century at Lydda, in Judea. He seems to have lost his parents when a child, for he was brought up by his grandfather, the eminent haggadist Joshua b. Levi. At an early age he displayed fine intelligence. 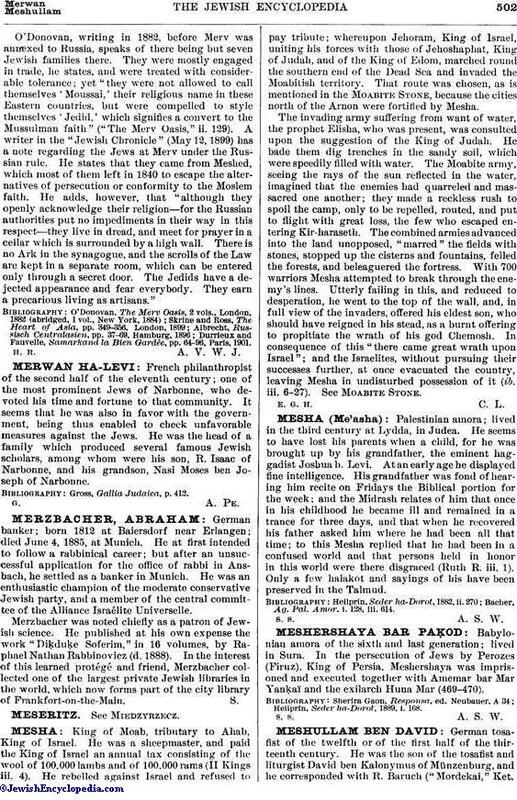 His grandfather was fond of hearing him recite on Fridays the Biblical portion for the week; and the Midrash relates of him that once in his childhood he became ill and remained in a trance for three days, and that when he recovered his father asked him where he had been all that time; to this Mesha replied that he had been in a confused world and that persons held in honor in this world were there disgraced (Ruth R. iii. 1). Only a few halakot and sayings of his have been preserved in the Talmud. Bacher, Ag. Pal. Amor. i. 128, iii. 614.